This user has rollback powers and has somewhat relative control of t3h ph1re! Hello everybody, this is ToastUltimatum, somehow still the resident Briton of SmashWiki! I'm a huge fan of the Inazuma Eleven series, and also a roboteer in featherweight robotic combat. Unsurprisingly then, I'm a R.O.B. main, and also an aspiring commentator, who has had the opportunity to commentate at a few Smash @ Xanadu events during overseas trips, where I also managed to escape pools and achieve 25th place in Brawl at Super Smash Con 2018. I was definitely present throughout 2013 and 2014, as I'd often refer to SmashWiki following a new announcement, and I'd sometimes be the first to update the wiki, occasionally getting to make a full article here and there. But halfway through 2014, a combination of priority changes on both the Internet and real life meant my attention had shifted from SmashWiki altogether, until I became inactive. Once my favourite TV show Robot Wars came back in 2016, my wiki efforts were permanently targeted towards that. So nowadays my main purpose on SmashWiki is just to update my Top Games List further down the userpage, but I'm not completely inactive with editing, and SmashWiki will always remain a large part of my life. I hope at least the majority of the modern users know of me in passing! Jibanyan is going to be a playable character in the Super Smash Bros. series. Of course I'm not amazing with anybody, and I really only see myself winning matches against good players using characters in the top two tiers, but this was what to expect, circa 2016. To some users, I offered two signatures. The signatures listed here are the alternatives I offered, but the other option was chosen. Some of the signatures listed here will since have been altered by the users that have these signatures assigned to themselves, with some remvoing their images to match a policy that was enforced after the signatures were made, while other users have a different image, font color, or have even changed their username since. If you have attempted to make a custom signature for yourself, but can't seem to grasp how to do it, you can ask me on my talk page, and I might make one for you. Asking for images in a signature means the signature would take longer, and I'd generally be more motivated to make you a signature if you didn't ask for an image, but I may still do it. You'd probably get a signature quicker from this guy though. The Flop Block, a glitch which I discovered myself. Template:Uv, which allows for significantly easier linking to Universe articles. Use by other Pokémon, to Razor Leaf, Flamethrower, Fly, Thunder and ExtremeSpeed. Throws, to Blaster, PK Fire, Flamethrower and Shadow Ball. Uploading new images for a notable amount of the character biography articles. Adding / improving the Assist Trophies section on non-character-represented universe pages. Fixed lots of the interwiki links after they were altered. The renaming of the Melee Stage Articles to a simpler paradigm. Project Terahertz, a project ran by myself to make an article for every music track in Super Smash Bros. Brawl, merged into list pages by their franchise, easily my largest contribution to the wiki. As well as making all of the articles in the template below, I also made the infobox, navigational template and linking that goes with it (excluding Template:SSBBMusicLink, which was made by Toomai.) I also started the project again with music from Super Smash Bros. 4, detailing the limited number of tracks we knew during the pre-release, before the project was finished by dedicated wiki members. * = I used a Heart Container before fighting Tabuu, but proceeded to defeat Tabuu without taking damage. My 1-Heart Container run of Boss Battles with Wolf can be seen during my Let's Play of Super Smash Bros. Brawl here. During my run with Ice Climbers, I beat Tabuu using Popo only. Be sure to click on the arrows next to "Console" and "Series" to see my favourite games of each series and console! All release dates are Europe-specific. Much as it looks like one, this isn't a complete list of every game I've ever completed, there are indeed games I've completed but didn't like enough to include, such as Mario & Luigi: Superstar Saga + Bowser's Minions, Mario Party: Island Tour and Sonic Boom: Rise of Lyric. Likewise, there exist games which I was enjoying enough to include, such as EarthBound and Mario Golf: Advance Tour, which I ultimately never finished. 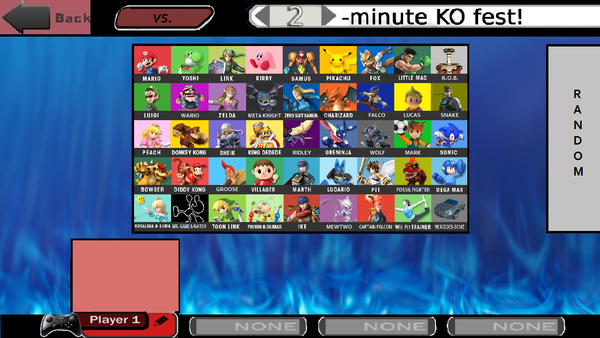 This is a roster I made shortly before E3 2014. I designed it to be a mixture of realism, and personal preference, very much to the extreme on the latter end. It was terrible. 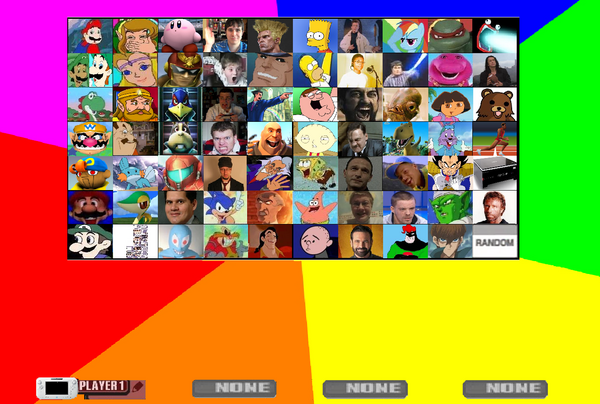 I found the roster to be realistic by including 45 characters, without over=representing any particular series, but some of my newcomers were very wacky, and the cuts were even worse. Every time you load this userpage, a new piece of video game music is randomly selected. This will often be a remix. Which will you get? This page was last edited on February 12, 2019, at 15:55.